Odyssey FZGSPBM12WBL Black Label DJ Coffin Glide Style DJParts - All Variety of Parts that DJ Needs. 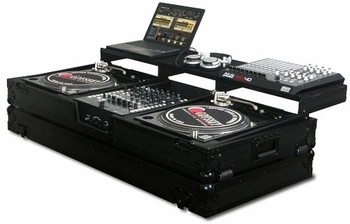 As the evolution of the DJ continues, so does the designs of Odyssey DJ coffins. Introducing the new REMIXER™ GLIDE STYLE SERIES DJ coffins featuring a full width glide platform to place all your DJ remix gear. With digital vinyl software such as Serato, Traktor Scratch, and Ableton, more DJs have gone through the transition from beat mixer turntablist to full on remixer producer. Availability of so many affordable remixing tools to the DJ such as midi keyboards and controllers to laptops and iPADs have grown to an ultimate high and Odyssey is there in the middle of it all providing these DJs the most functional DJ coffins yet with the REMIXER™ GLIDE STYLE SERIES. • Mixer well holds mixers with a width of up to 12.50 ", depth up to 21.5" and 3.25" tall.